I own a flock of geese. My flock numbers over 100 birds and lives with me throughout the entire year. This is an odd statement for anyone other than a farmer to make. The food and space resources necessary for such a large avian aggregate would be beyond what any suburban residing outdoorsman could dream of providing. For nine months of each year my flock hibernates in the rafters of my garage. As silent and statuesque as terra cotta warriors in a Chinese Emperors tomb, my geese await to do my bidding on some winter cornfield. My flock is not flesh, blood, and feathers, but the plastic and paint of the Avery Outdoors Company. I am the king of my own terra plastic warriors. I am a goose hunter. To say I am a goose hunter is a bit of an understatement. It should read that I am a recovering addict from the constant and unrelenting pursuit of Branta Canadensis, (Canada Goose). My addiction has been in recession for the past 24 months, after a run of 13 continuous years. I have all the paraphernalia of an addict: calls, decoys, camouflage, and even some of the contraptions that were sold to me that promised to bring all the geese in the world into my decoys. Of course I believe some of these items were meant more to decoy the hunter, rather than the bird. My recession ended this past Tuesday when I went hunting with a good friend and his family after they graciously invited me to join them. I had missed hunting geese and knew it would be a good break from pursuing kitties in the mountains. There is a certain structure and near religious pattern to field goose hunting. Rising well before the sun has peeked above the horizon, you stumble to your cold truck packed full of gear and decoys. Cup of coffee in hand and perhaps a hunting buddy in the passenger seat you head off to the field chosen to hunt for the day. 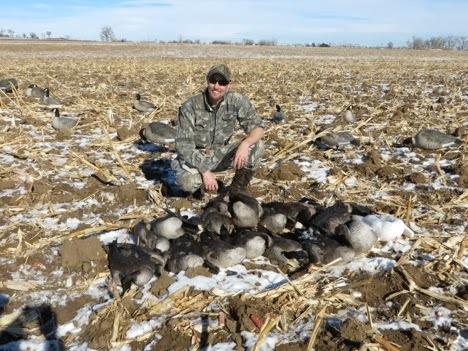 With hopes to have all the decoys set before the geese fly, you arrive at the location and meet your hunting partners. There is talk of wind direction, blind placement, decoy patterns to set, and where and when the birds will fly. As you rush to set up, every hunter is keenly aware of sounds, fearing not to hear the first honk of the morning until all is ready. This past Tuesday, December 10, the field I was invited to hunt was a recently cut cornfield. The snow was just beginning to recede from the field, but you could clearly see the tracks of thousands of geese who had landed and fed in the very same field the day before. As we completed setting up, the first flocks of the morning appeared above the field. Immediately getting into the blinds we did our best to call the geese down and into the landing spot of the decoy pattern. Geese were everywhere and nearly every flock wanted to come in and take a look at our dekes (decoys). Coxing them into the final shooting position, feet down and just above the decoys, proved to be a little more of a challenge. Only the choicest and closest shots were taken. At times hundreds of geese were spinning and funneling above the decoys. It was a sight I had not seen and years, and may indeed be years before I will see again. So many geese were flying in the area that hunters who went to retrieve downed birds could not get back into the blinds for fear of spooking an incoming flock. After several hours of hunting and shooting we called the morning hunt and decided to pick up the plastic flock. The count for the morning was 18 Canada Geese and 1 Snow Goose. Photographs and hunting stories were exchanged as all the decoys were placed into their cases and then neatly crammed into the back of my truck. Driving home, my thoughts turned back to Lion hunting. I had really enjoyed the camaraderie and returning to a previous passion for a day. However; I knew that somewhere out among the snowy rocks and peaks was a solitary roaming majestic cat, whose meeting with me on some distant day is only a matter of time, determination, and little bit of luck.